Golra Sharif is a town situated near the Margalla Hills, in the Islamabad Capital Territory, Pakistan, at about 520 m (1,710 ft) above sea level, 17 km (11 mi) from the ancient city of Taxila. 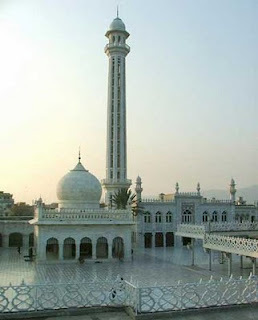 Golra Sharif is a shrine of the Sufi Mystic Pir Meher Ali Shah in Islamabad, Pakistan. Golra Sharif also has fundamental importance geographically. The vast tracts of Margalla Hills and their adjoining plains have been witness to a vast panorama of chequered history. The area extending from Hasan Abdal to the neighbourhood of Taxila, a settlement traced back to 2000 years , is custodian of a rich cultural heritage of pre-Islamic period. Even today the archaeological remains dotting the area furnish evidence of the splendid cultural and religious traditions of Buddhist era. Eminent historians of the world agree that it was here that Greek wisdom and Indian civilization meshed together to bring about a synthesis which influenced cultures and art movements everywhere.